Welcome to this edition of the Productive Business Magazine Blog – The power of collaboration. Its an honor and a pleasure to bring to you the best and the brightest from all around the world as we talk productivity in business. Today I have the pleasure of introducing you to a good friend of mine, Pastor Daniel Voss. Pastor Daniel Voss was born and raised in Tulsa, Oklahoma. Daniel began preaching the Gospel at the age of 16. He quickly became a much sought after speaker. His decision to pursue God’s calling upon his life led him to Randall University in the fall of 1998. While at Randall University he became a Freshmen All-American for the Saints baseball team. Daniel graduated in the Spring of 2001 with a degree in Theology and minor in Greek with an emphasis in Education. While in college he also began working at the West Tulsa Baptist Church as a Youth/Assistant Pastor. 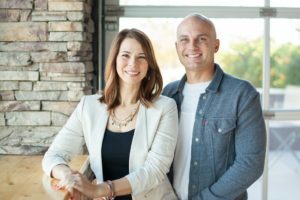 In February 2004, Daniel became the Lead Pastor of the West Tulsa Church. He led the church in a million-dollar gymnasium/educational facility expansion. In Oklahoma, he served on various boards, such as the Oklahoma State Christian Education Board and Greater Tulsa District Education/ Next Generation Board. In 2009 Daniel moved to Phoenix, Arizona where he began serving as Discipleship Pastor for Mountain View Church. In February 2012, he became Lead Pastor of Mountain View. Under his leadership, Mountain View has grown from a church of 500 to a thriving church with a weekly attendance of 2500. Mountain View is recognized by many organizations as a fast-growing church that is changing its community at an unprecedented rate. PBM: Welcome Pastor Daniel Voss. How are you today? Pastor Daniel: Dr. Vern, glad to be with you today. PBM: Well, Pastor, it’s an honor and a privilege to interview you today. I know you have multiple things going on, especially with your schedule, so thank you for carving out some time to sit with me. When I tell you that Pastor Daniel is a man on the move; imagine preaching four celebrations on a Sunday, and still having time to pour into your leaders, write a book, complete an audiobook, host several life-changing events like We Start Churches, and be the #1 Socially Engaged Church In The Valley. Folks, if you think I’m productive, you need to check out Pastor Daniel Voss. Sir, I wanted to talk to you about Leading From Up Front: How To Create & Keep A Strong Culture. There’s so much going on in our world today and I know that you have the philosophy that it takes to change, shape, and build strong leadership cultures. PBM: What are your thoughts on culture and how to create a strong culture? 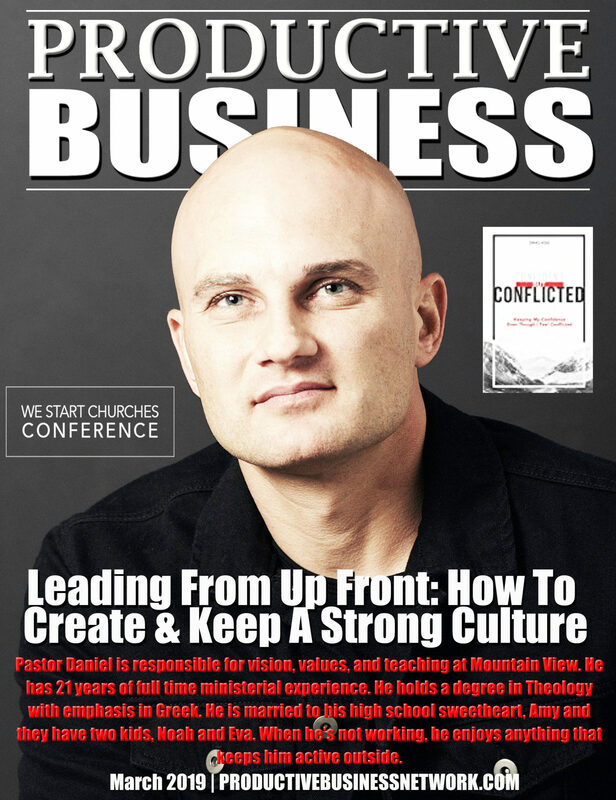 Pastor Daniel: Every church, business, and family has a culture. Even if we haven’t intentionally created a specific culture, every organization has one. Culture eats vision for breakfast! Visions are cute sayings written down. Culture is how or even if those sayings are played out. In order to have a strong culture, your vision/values must shift from being clever sayings to the cornerstone in which everything operates. PBM: How do you create a strong culture? Pastor Daniel: Be the culture you want to create. What type of organization are you passionate about leading? This is the first question you need to answer. In other words, what type of church would you attend if you didn’t Pastor? If you don’t know what it should look like, other people will be glad to decide it for you. Once they do, you will never change it. You have to lead the way in what type of culture you are trying to create. So whatever God is telling you to do, you have to lead it, and live it. If you don’t they won’t. Bottom line is: The heart in which something is created is the heart in which it impacts people. You have to believe in the culture you are trying to create. This is way too important to delegate. It’s not your Worship Pastor’s Job. Young hip student guy or XP. It’s your job. Once you discover what you want your organization to look like, you have to do everything in your power to keep it in front of your people. PBM: What are some ways that you do that? Pastor Daniel: We use sermons, signage, statements, and swag. It is also good to use pictures, your social media, special emails, and video stories. (These platforms should not be used for information, but inspiration and motivation. So, share life transformation.) It must be done in every setting and at every stage and age. PBM: Those are great ways to keep the culture fluid and in front of the people. Pastor Daniel: Motivation comes from appreciation so reward staff and volunteers who are modeling the culture. What gets rewarded gets repeated. Make the celebration of your culture a part of every team meeting, one-on-one conversation, and every lesson. See every conversation and decision through the lens of your cultural values. Because every decision and conversation you have is going to reinforce the culture or detract from it. PBM: What’s the phrase that pays when it comes to building a strong culture? I love this little phrase because it does two things. First, it expresses gratitude, second, it reminds people of the vision and values. I might say “Thanks for helping us celebrate Jesus” or “Thanks for helping people win.” What you’re doing is connecting the dots. You’re helping your team members realize that they are directly helping a vision that’s bigger than you and bigger than them. Go back to your vision, again and again, and let people see how they’re accomplishing it. PBM: How do you hire the culture you want to create? Pastor Daniel: Nothing will add or take away from your culture faster than the people you hire. Most Churches hire based on two criteria: Character and Competency. That’s awesome, but that fails to take into account cultural fit. The staff is the one that carries out the culture. That is why you cannot afford to compromise. No matter how bad a staff member is, they will gain a following and it will cost you. You get what you create, you keep what you tolerate, and it’s way too important to delegate. As a leader or culture creator, you have to be the CRO- Chief Reminding Officer. You have to speak it/repeat it, write it/repeat it, model it/repeat it, protect it/repeat it, again and again. PBM: What are some of the ways you propose doing this? Pastor Daniel: Staffing: Write job descriptions based on the culture you want to create. When interviewing: Ask them to explain the culture in their own terms. Make them apart of your performance review. When correcting, celebrating, or having hard conversations, always refer back to the culture. Look for volunteers who model cultural values and treat them like staff. Can’t say we are reaching the young married if the staff age is 55. PBM: What are some ways to create cultural clarity and consistency? Pastor Daniel: Staffing, systems, settings, and singing must be synergetic. Most churches go wrong because they allow each ministry to have different names, brands, and vision statements. As an example here are the ministry names we use: MV EC, kids, Pre-teens, Students, Adults, Groups, _ clear trumps cute. Never have to explain. Sermon: All of Sunday is a sermon. You and I just play a small part. This requires extreme intentionality and one of the most effective ways to keep consistency is by understanding all of Sunday is a sermon. It is a reflection of the culture you are trying to create. So from the parking lot to the pew everything must be consistent and should be a reflection of the culture. Can’t say you are energetic if you’re not. Singing: Every age and stage should be mirroring the culture of your adult service. It can’t be weird or foreign from one stage to another. This ensures the culture. Can’t be modern with youth and traditional with the adults. It’s only a matter of time before there is a disconnect. Setting: We also overlook the importance of the environment. Everything starts with the environment and filters through the senses. They see you long before they experience you. So make sure you have a common look, language, feel, sound and smell at every age and stage. Can’t say you are modern or cutting edge if everything looks like it’s from the 1990’s. PBM: How do you change the culture? Define Reality- Where are we? Dream of a Future- Where do we want to go? Design a Path- How and who can get us there? Drop the distractions- Not every ministry is meant to last forever. Develop leadership pipelines– Get as many people on the same page as possible. Treat High Capacity Volunteers as Staff. Create a system where volunteers can learn and understand the cultural values that drive the organization. Develop plum line statements– Clear and easily communicated statements go a long way. Be prepared for short-term Not every person is meant to be a part on your team forever. Be ready to lose people who aren’t sold out to the culture you are trying to create. PBM: How do you propose change occurs? Pastor Daniel: Be bold! Small tweaks never change the world. Changing the way something looks is not bold. Changing the way you think, operate, and staff is bold. Have a call to action. Out of seats into the streets! Be a little crazy/confrontational- If you want everyone to be happy, sell ice cream. If you want to change the world; be bold.